It was some time in 2011. 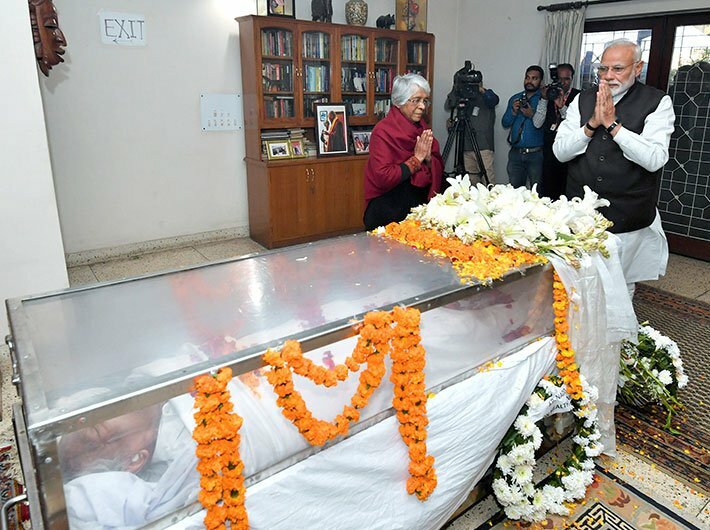 Lal Krishna Advani was in his chamber in the parliament complex waiting to receive George Fernandes, a long-time friend and political comrade-in-arms. Fernandes was ushered in assisted by his wife, Leila Kabir, and sundry aides. His walk was infirm. Vajpayee died in August last year after being bed-ridden for around a decade during which time he could not recognise anybody. Singh continues to be in a similar state. “Yes,” said a delighted Advani, but his happiness was short-lived. Almost immediately Fernandes withdrew into his own world. But the Fernandes that the world and Advani, who narrated this incident to me, will remember was anything but infirm. Fernandes was a stalwart of Indian politics. Jailed during the Emergency, he roared like a lion from inside the cage. The picture showing him handcuffed inside the jail evoked sympathy across the country. Coming from a Christian family from Karnataka, he imbibed the true spirit of India. He transcended the boundaries of region, religion and caste. Fernandes was as much at ease in Mumbai, Delhi, Bengaluru, Chennai or Kolkata as in the backwaters of Bihar – Muzaffarpur, Nalanda or Barh. In Bihar, he was even called George Fernandes “Mahto”, a surname he acquired on account of his close association with Nitish Kumar who belongs to Kurmi caste. In fact, the family of Fernandes bore the brunt of the Emergency excesses. His brother Lawrence Fernandes was arrested and tortured for months on end as the firebrand leader gave the police a slip and went underground. His name figured in the famous Baroda dynamite case in which he was arraigned by the Central Bureau of Investigation (CBI) for smuggling in explosives to blow railway tracks and government facilities to protest against the Emergency. Perhaps Fernandes’s implication in the Baroda dynamite case signaled the brazen misuse of the government agencies to target political rivals. The then prime minister Indira Gandhi triggered the decline of the CBI which became irreversible till now. There is no doubt that Fernandes belonged to a genre of socialist leaders who were exceptionally deft at defending the indefensible. No doubt, he emerged as hero in the post-Emergency era and became industry minister in the Morarji Desai government. Coming from a trade union background, he invoked the Swadeshi spirit of Mahatma Gandhi to ban MNCs like Coca-Cola. Fernandes was endowed with the rare gift of gab that proved to be his asset... and liability as well. During the turmoil in the Janata Party government when Chaudhary Charan Singh revolted against Desai, Fernandes had shown his inclination to side with Desai. He gave a long speech in the Lok Sabha in support of the Desai government. He, however, conveniently switched his loyalty when Charan Singh formed the government with the help of Indira. Perhaps nothing caused as much damage to his credibility as that moment of political vacillation. He carried the image of a leader whose political beliefs were always on shifting ground. Except for the fact that he was a die-hard proponent of anti-Congressism, Fernandes was not averse to any tie-ups to grab power. He was with VP Singh during the Janata Dal government and later aligned with the BJP to oust Lalu Prasad Yadav in Bihar. In effect, his political constituency in the later phase of life was confined to Bihar, owing to his proximity to Bihari leaders who ranged against Lalu. Given Fernandes’s tall stature, he became the pivot around which anti-Lalu politics revolved. He formed the Samata Party which later became Janata Dal (U) in which Nitish occupied the pre-eminent position. Till the 2004 Lok Sabha elections, Fernandes maintained his relevance although he was marginalised within the NDA fold. After the NDA lost power in 2004, once again the CBI was used to implicate him in a dubious case of defence deals. In the 2005 Bihar assembly election, he seemed quite desperate to retain his political hold. That was the time when Nitish Kumar was declared the NDA’s chief ministerial candidate by Advani, then BJP president and Leader of Opposition in Lok Sabha. Fernandes was not initially in favour of declaring any chief ministerial candidate but bowed to people's pressure. That was the time for him to realise the great truism of politics: Every great career in politics tends to end eventually in a failure.